Nindie Showcase Breaks Down 16 Upcoming Indies for Switch | Nerd Much? Nintendo’s Nindie Showcase dropped just a bit ago, and it was a very solid showing. While only a little over 10 minutes in length, it provided a promising look at some of the smaller titles coming to Switch in spring and summer. Many of which are timed exclusive for the system. The presentation kicked off with Klei Entertainment’s Mark of the Ninja Remastered. Originally released back in 2012, the side-scrolling action stealth game had fantastic reviews on Xbox 360 and PC. It hits the Switch this fall. “Anything can be a weapon”, with examples shown being the wind, fire, ghosts, gambling, paint, and even time itself. The game will be playable solo, online, and via local multiplayer. It hits Switch courtesy of Sirlin Games this summer. We then got a quick look at the “musical bullet-hell game”, Just Shapes and Beats. Set to chiptune music, it’s quite the unique take on the genre. It features a full story mode playable both local and via online co-op for up to four. From Berzerk Studio, it hits the Switch first this summer. Garage was up next. It’s a top-down zombie/monster horror title which Nintendo’s Damon Baker said included “stuff we can’t even show you in this video.” It’s a title derived from the likes of ’80s horror B-movies and comes to Switch first from Tiny Build in spring. Adult Swim Games will bring us Pool Panic this spring, first on Switch. It’s “one giant cartoon game of pool.” “Sinking the 8-ball is the ultimate goal,” but navigating your clueless cue-ball is the gist of the game. You’ll be confronted by biker balls, ballerina balls, pirate balls, devil balls – and just all sorts of balls trying to block your progress. “It’s weird and crazy in a really, really fun way” says Baker. There are over a hundred levels and local multiplayer for up to four. Lumines Remastered was announced next. It’s an HD remaster of the critically acclaimed title that originally launched from Q Entertainment back in 2004. It’s essentially a Tetris-styled puzzle game that revolves around sound and light patterns. It will feature local multiplayer and will incorporate the Switch’s HD rumble into gameplay. It hits the Switch this spring. Reigns Kings and Queens is coming this spring too. And it sports exclusive local multiplayer for the Switch. You’re tasked with handling a seemingly never ending chain of requests from your realm’s population – including its enemies. As you run your kingdom, you’ll have to outwit and outlast those that wish to overthrown your reign. The critically acclaimed Light Fall followed that in the Nindie Showcase. It’s an amazing looking platformer from Bishop Games in which your character utilizes the title’s Shadow Core to help him quickly platform the game’s environments. Today’s Nindie Showcase exclusively revealed Light Fall’s speed run mode, and announced the title would be hitting the Switch first in spring. West of Loathing came next. It’s a quirky stick figure comedic western that you’ll have to see for yourself to believe. It featured turn-based combat across three different character classes. It’s coming to Switch this spring. Pode from Henchman & Goon then premiered. Coming this spring, it’s a “co-op exploration game” that takes place within a mysterious mountain. The setting is inspired by Norwegian art and culture, resulting in some pretty impressive art direction. The Messenger debuted next during the Nindie Showcase. Looking at the title, it looks extremely reminiscent of the classic Ninja Gaiden games. However, it incorporates a mechanic that switches the title’s visuals from 8 to 16 bit. It’s coming this summer. Bad North followed The Messenger. It’s a “real time tactics rogue like game” that features permadeath for your characters. Each Commander you lose while playing is gone for good. “Lose everything and it’s game over.” It will launch first on Switch from Plausible Concepts and Raw Fury this summer. Nintendo also announced that The Banner Saga and The Banner Saga 2 would be “coming soon” to Switch. Playing through those to titles first will have your save files carry into The Banner Saga 3 when it launches. 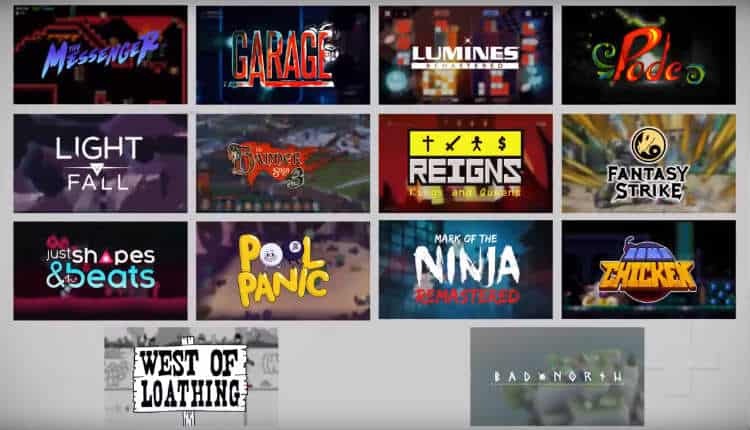 All in all, it was a great ten minutes that featured a nice selection of upcoming indies for the Switch. And it essentially only covered what’s headed our way in spring and summer. There’s sure to be plenty more to come.